Anyone adjudicated as mentally defective, been committed to a mental intuition, or have a history of mental illness. Unlawful users of depressants, stimulants, narcotic drugs or any other controlled substance. Anyone under legal restriction which would prohibit owning, possessing or having access to firearms under Federal, State, or local law. Persons with physical or mental impairment which would render firearms activity unsafe. Guests: Guests are NOT covered by our liability insurance. All members with guests (guests include spouses and family of members) must first stop at the Guest Kiosk and complete the Guest Form provided. Each member is limited to three (3) guests per visit. 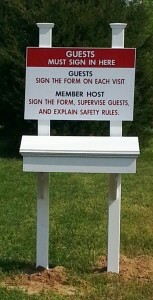 Guests must sign the GUEST LICENSE AGREEMENT provided in the Guest Kiosk. The Sponsoring Member must witness the signatures of all guests and sign where indicated. Members are responsible for briefing guests on Club rules and for assuring that guests follow all range and safety rules. While on club ranges, members must remain with their guests. It is NOT allowed for a guest to shoot on a range other than that range the member is on. Youth: Anyone under the age of 18 not accompanied by a parent or legal guardian must be accompanied by an adult member and have written authorization from a parent or legal guardian to be on the range and to have access to firearms and ammunition. VISITORS: Invited visitors must sign-in at Event Registration or must be accompanied by an RPRC official. NON-MEMBERS ON RPRC PROPERTY WITH NO HOSTING MEMBER PRESENT OR NOT ACCOMPANIED BY AN RPRC OFFICIAL ARE SUBJECT TO TRESPASSING CHARGES. Shooting is allowed from 9am to sunset, Monday through Saturday. Sundays from 1pm to sunset. The range is controlled by a radio frequency card reader system. There is a card reader on the left as you approach the gate from outside on entry and another inside the range on the left for exit. Hold your card within three inches of the reader until it beeps. The gate will open for one, and only one, vehicle to enter or leave and close automatically. Guests in separate vehicles may enter upon a separate operation of the gate for each vehicle. If you have guests entering in their own vehicle, open gate for them to pass, then repeat. If the gate is locked open for an event you are still required, both coming and going, to use your card to record your entry to and departure from the range. Lead accumulation on Club ranges is a concern. In 2005 RP and RC was awarded a Environmental Protection Agency Best Practices Certificate for Lead Management. To comply with our EPA Best Practices procedures, each shooter (members & guests) must log the number of rounds shot on each range on the Range Logout Sheets provided. When you have finished shooting, you must enter the number of rounds fired on each range under the appropriate caliber. Log out forms are provided in a box hanging on a post at each range. For-the shotgun range, the number of rounds (not gauge) fired is required for each event type (Trap, Wobble Trap & 5 Stand). Each member MUST visibly display their membership ID badge when on club property. Portable toilets are located behind the shotgun range, and across from the 25-yard Please keep them tidy and clean. Report problems to the Range Operations Officer. AUTOMATIC EXTERNAL DEFIBRILATOR (AED): An AED is located in the green gate shed near the An un-locked access-door marked "AED HERE" is located in the front right area of the gate house where the AED can be accessed. The device is fully automatic with instructions provided. Call 911 for emergency situations requiring EMT and/or local police. Render aid as appropriate for the individual in need, sending another member (when available) to the gate to direct emergency services to the appropriate range. The range is located at 640 Blueberry Point Road, White Stone VA.